Once upon a time, not so long ago, the word “legendary” was only used to describe the most marvelous wonders and audacious feats of humankind. Now it’s commonplace – so much so that there’s an Internet meme saying, “It’s legen…wait for it…dary!”. How can blues listeners help this word regain its former glory? 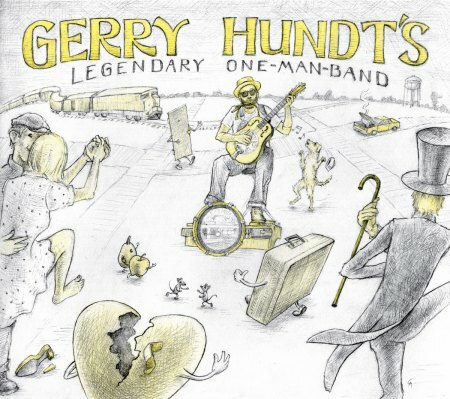 One way is by testing any musician who makes such a claim, as Rockford, IL-raised, Chicago stalwart Gerry Hundt does while promoting his Legendary One-Man Band. A hallmark feature of a legend is that it’s passed on through word of mouth. In Hundt’s case, this is clearly so. He’s been called “Mr. Universal” and “Mr. Versatile” by several die-hards, including fans of Nick Moss and the Flip Tops, in which Gerry performed. On the inside of his newest CD’s cover, Hundt lists that he plays a “Farmer StompDrum, OME Minstrel, Screaminchickenz Firebird, Gibson Les Paul, National M2, Front and Center G-Rig, kazoo, harmonica, National Dueco, hi-hat drums, ARK New Era Maurer, Supro Dual-Tone, [and a] Farmer Foot Drum”. Three of the guitars listed are acoustic, but one is electric, as pictured in the liner notes drawing. It takes considerable talent to use any one of these instruments and amps, let alone by a sole musician. On six covers and nine originals, Gerry Hundt plays foot-stomping, old-fashioned blues. No one will hear any New Millennium synthesizers here. Even though Hundt’s vocals are a bit flat, the album is first rate. How does Hundt succeed as a one-man band? As he says in his informational promo sheet, “It’s just practice – doing it all the time. When you start out, you walk [i.e., use both feet] – bass drum, high-hat [cymbals]. Bass drum, high hat. And some folks don’t get past that.” Assuredly, Gerry is not just “some folks”. 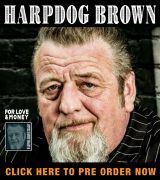 He’s a veteran of the blues full of dedication, not a dilettante. 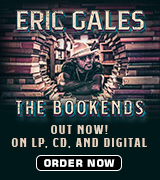 Track 02: “Stompin’ and Shoutin’” – Sometimes “raising sand,” as the blues saying goes, just isn’t worth the hassle in a relationship: “Stompin’ and a shoutin’ ain’t gonna do you no good. You gotta calm down, baby, like you know you should.” Is this funny or sad? For a clue, check the back of the CD cover. Above this song’s title is a high-heeled shoe with a broken heel. The best part of this song is the harmonica, rueful and witty at the same time. Track 05: “Sunset” – Does acoustic reverie belong on a blues album? Yes, indeed! Sometimes the low-down aching chill of regret arrives gradually. On a different note, relaxation and peace are what the blues helps people to find. Kick back and enjoy the mellow “Sunset” while it lasts. 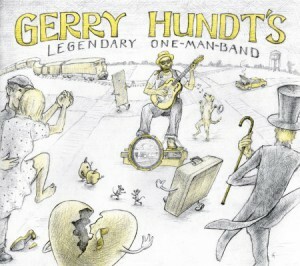 Without a doubt, Gerry Hundt’s got a Legendary One Man Band!